REDMOND, Wash.–(BUSINESS WIRE)– Imagine driving in the middle of the desert and seeing a couch, TV and video game system in the middle of nowhere, or skiing down the side of a mountain and seeing another one of these surprising setups sitting there in the snow, ready for a round of gaming. It’s a striking visual, sure, but it drives home the message of Nintendo Switch, Nintendo’s revolutionary new video game system that launches on March 3. Nintendo Switch is a home gaming system with the portability of a handheld. The system lets you take home video game experiences anywhere you go, offering you the freedom to play where, when and how you like. 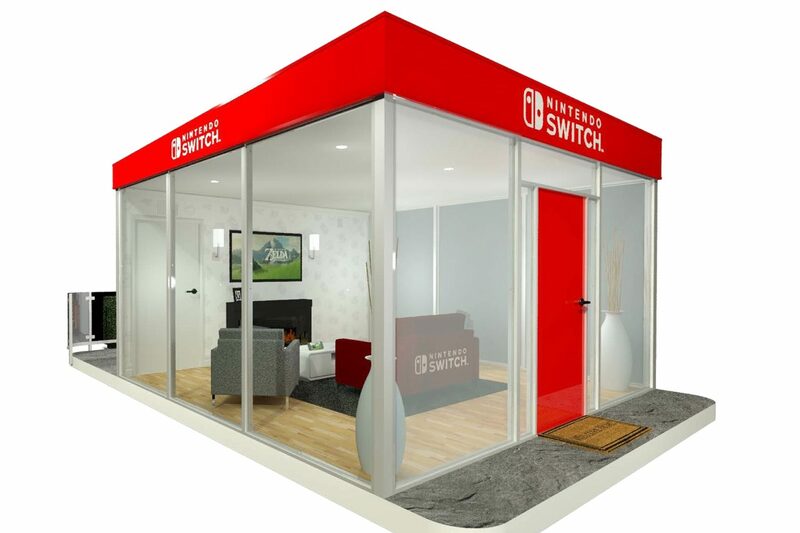 To showcase this unprecedented new style of console gaming on the go, Nintendo is showcasing the versatility of Nintendo Switch across the country with highly visual, interactive living room-inspired spaces in places you would never expect, bringing surprises to every stop. The first Nintendo Switch experience will pop up in the desert at Blue Cloud Movie Ranch on Feb. 23. Invited guests will get the chance to enter the interactive space and experience different Nintendo Switch games, as well as delight in the novelty of playing these games in a completely unexpected locale. To make the first stop even more exciting, John Cena will be the special guest at this location. As a WWE Superstar and actor who is as versatile as the Nintendo Switch console itself, the performer (and Nintendo fan) Cena is the perfect person to kick off this unique tour. Known for his charisma and family-friendly appeal, John Cena will showcase the face-to-face off-TV functionality of 1-2-Switch, a Nintendo Switch launch game that features hilarious activities like milking a cow and participating in a Wild West duel. Cena will play the game with invited fans and YouTube influencers, highlighting how fun it is to play 1-2-Switch using the innovative new Joy-Con controllers. The second Nintendo Switch experience will pop up in Aspen, Colorado, on Feb. 27 at the popular Snowmass ski resort. Again, the unexpected location highlights that Nintendo Switch games can be played anywhere – even somewhere as remote as the side of a snowy mountain! The final stop on the Nintendo Switch journey will be in Madison Square Park in New York on launch day, March 3. Surrounded by excited fans and curious onlookers, the event will kick off a new era in Nintendo gaming. Two famous (and super) brothers named Mario and Luigi will also attend the final event to celebrate launch day. Each of these Nintendo Switch experiences will be an absolute spectacle, featuring visuals that remind people of home gaming, but set in wildly unexpected places. Seeing these familiar settings set against dazzling backdrops like the open desert, snowy mountains and bustling city will drive home how Nintendo Switch transforms any space into a place to play. Broadway between 23rd and 24th St.
Nintendo Switch launches worldwide on March 3 at a suggested retail price of $299.99. Two stylish versions of the system will be released: a version with a set of gray Joy-Con, and a version with one neon blue and one neon red Joy-Con. Both versions will have the same suggested retail price. At home, Nintendo Switch rests in the Nintendo Switch dock that connects the system to the TV and lets you play with family and friends in the comfort of your living room. By simply lifting Nintendo Switch from the dock, the system will instantly transition to handheld mode, and the same great gaming experience that was being enjoyed at home now travels with you. The portability of Nintendo Switch is enhanced by its bright high-definition display. It brings the full home gaming system experience with you to the desert, on a snowy mountain or even during a busy city commute. Remember that Nintendo Switch features parental controls that let adults manage the content their children can access. For more information about this and other features, visit http://www.nintendo.com/switch. For more information about these events, visit http://www.nintendo.com/switch/events/.